The Orion Systems IP Console interconnects Console Operators with radios, telephones, and other console operators over Ethernet utilizing Voice over IP (VoIP) and Radio over IP (RoIP) protocols. 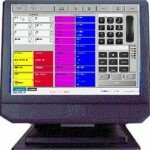 The IP Console is comprised of a Windows based PC, an Orion Systems GUI application and a headset jackbox. The Windows based PC can be either a desktop, laptop, a push button end instrument or a rugged tablet used in mobile command situations. The PC types listed above are available as standard office environment or can be configured with high bright displays for sunlight readability, wide temperature for outdoor use, and rugged environment to protect against vibrations. The IP Console GUI includes Per Circuit Volume, Patch, Audio Present, Multi-Monitor, Mute, Mute All, Simu-Select, All Call, and Headset Volume selections. Telephone functions such as Caller ID, Redial, Transfer, Conference, Hold, and Do not Disturb are standard features. The headset/handset jackbox allows two operators to share a single IP Console. The jackbox has field configurable gain settings to match a dynamic, electret, or carbon / carbon equivalent microphones. A volume pot is provided for each headset/handset interface. The headset/handset interfaces can be set to operate as supervisor/trainee or equal capability.